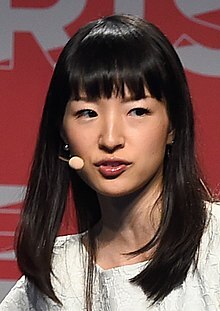 Marie Kondo (近藤 麻理恵, Kondō Marie, born 9 October 1984), otherwise known as Konmari (こんまり, Konmari), is a Japanese organising consultant and author. Kondo has written four books on organizing, which have collectively sold millions of copies and have been translated from Japanese into several languages including Korean, Chinese, Spanish, Indonesian, French, German, Swedish, Portuguese, Catalan and English. In particular, her book The Life-Changing Magic of Tidying Up (2011) has been published in more than 30 countries. It was a best-seller in Japan and in Europe, and was published in the United States in 2014. In the United States and United Kingdom the profile of Kondo and her methods were greatly raised by the success of Netflix series Tidying Up with Marie Kondo, released in 2019. Kondo says that she has been interested in organizing since childhood. In junior school, Kondo ran into the classroom to tidy up bookshelves while her classmates were playing in physical education class. Whenever there were nominations for class roles, she did not seek to be the class representative or the pet feeder. Instead, she yearned to be the bookshelf manager to continue to tidy up books. She said she experienced a breakthrough in organizing one day, "I was obsessed with what I could throw away. One day, I had a kind of nervous breakdown and fainted. I was unconscious for two hours. When I came to, I heard a mysterious voice, like some god of tidying telling me to look at my things more closely. And I realized my mistake: I was only looking for things to throw out. What I should be doing is finding the things I want to keep. Identifying the things that make you happy: that is the work of tidying." She spent five years as an attendant maiden at a Shinto shrine. She founded her organising consulting business when she was 19 and a sociology student at Tokyo Woman's Christian University. In her senior year, she wrote her capstone thesis titled "Tidying up as seen from the perspective of gender". Kondo's method of organising is known as the KonMari method, and consists of gathering together all of one's belongings, one category at a time, and then keeping only those things that "spark joy" (ときめく tokimeku, the word in Japanese, means "flutter, throb, palpitate"), and choosing a place for everything from then on. A two-part TV dramatisation was filmed in 2013 based on Kondo and her work, titled 人生がときめく片づけの魔法 (Jinsei ga Tokimeku Katazuke no Mahō). She has lectured and made television appearances. She released a series of videos teaching "the best way to fold for perfect appearance". On 1 January 2019, Netflix released a series called Tidying Up with Marie Kondo. In the series, Kondo visits various American family homes full of clutter and guides the families in tidying up their houses through her KonMari method. On 4 February 2019, Kondo appeared on The Late Show with Stephen Colbert on CBS. Kondo married Takumi Kawahara in 2012. At the time they met, Kawahara was working in sales support and marketing at a corporation in Osaka. Once Kondo's career took off, he left his job to become her manager and, eventually, CEO of Konmari Media, LLC. The couple have two children. After getting married she lived in Tokyo, and later moved to San Francisco. As of 2019, she and her family live in Los Angeles, California. Jinsei ga Tokimeku Katazuke no Mahō (人生がときめく片づけの魔法). German translation. 2013; ISBN 978-3-499-62481-0. English translation. The Life-Changing Magic of Tidying Up: The Japanese Art of Decluttering and Organizing. New York: Ten Speed Press, 2014; ISBN 978-1607747307. Jinsei ga Tokimeku Katazuke no Mahō 2 (人生がときめく片づけの魔法2). Tokyo: Sunmark Shuppan, 2012; ISBN 978-4-7631-3241-3. Mainichi ga Tokimeku Katazuke no Mahō (毎日がときめく片付けの魔法), Tokyo: Sunmark Shuppan, 2014; ISBN 978-4-7631-3352-6. Irasuto de Tokimeku Katazuke no Mahō = The Illustrated Guide to the Life-Changing Magic of Tidying Up (イラストでときめく片付けの魔法）. Tokyo: Sunmark Shuppan, 2015; ISBN 978-4-7631-3427-1. English translation. The Life-Changing Manga of Tidying Up: a magical story. New York: Ten Speed Press, 2017; ISBN 978-0-399-58053-6. ^ Stern, Claire (23 January 2016). "Who Is Marie Kondo? 7 Things You Might Not Know About the Japanese Decluttering Guru". InStyle. Time Inc. Retrieved 12 August 2016. ^ 寺町幸枝 (21 January 2019). "「こんまり」流が全米に拡散――ネット番組のヒットで日本発の片付け術が急激に広まっている". Newsweek Japan. Newsweek Japan. Retrieved 11 March 2019. ^ a b c d "Kissing Your Socks Goodbye: Home Organization Advice from Marie Kondo". The New York Times. Retrieved 26 October 2014. ^ "Gramedia.com – Marie Kondo, "The Life Changing Magic Of Tidying Up" (Indonesian version)". Gramedia Indonesia – Online books. 2018. Retrieved 31 March 2018. ^ a b c Maloney, Jennifer; Fujikawa, Megumi (26 February 2015). "Marie Kondo and the Cult of Tidying Up". Wall Street Journal. Retrieved 1 March 2015 – via konmari.com. ^ "Marie Kondo's Tidying Up Won Netflix. Next? Cleaning Consultants - Bloomberg". ^ "John Lewis is selling 47% more of this thanks to the Marie Kondo effect". ^ Jamie Lee Curtis (2015). "Marie Kondo". Time Magazine. Retrieved 16 May 2017. ^ a b c "Marie Kondo is the maiden of mess". Theaustralian.com.au. Retrieved 26 October 2014. ^ Maguire, Katy (7 July 2016). "6 surprising things about Marie Kondo and her life-changing method". Well+Good LLC. Retrieved 13 August 2016. ^ Aihara, Hitoshi (13 May 2015). "こんまりキレイ術の心は感謝　31カ国200万部超". Nikkan Sports. Retrieved 11 February 2019. ^ "Japanese-English translation: tokimeku: Dictionary". kanjijapanese.com. Retrieved 1 March 2015. ^ a b "Japan's 'queen of clean' promotes benefits of a tidy home". The Globe and Mail. Retrieved 26 October 2014. ^ "How KonMari's phenomenal book can help put your house in order". Japantimes.co.jp. Retrieved 26 October 2014. ^ Demetriou, Danielle (16 January 2016). "Japan's decluttering guru says she is on a mission to 'organise the world'". ISSN 0307-1235. Retrieved 14 January 2019. ^ Dilloway, Margaret (22 January 2019). "What White, Western Audiences Don't Understand About Marie Kondo's 'Tidying Up'". Huffington Post. Retrieved 27 January 2019. ^ "人生がときめく片づけの魔法". ntv.co.jp. Retrieved 7 March 2015. ^ "5 Ways Marie Kondo Can Declutter Your Home And Help You Reach Your Financial Goals". Forbes.com. Retrieved 5 February 2019. ^ Colbert, Stephen (4 February 2019). "Taraji P. Henson, Matt Walsh, Marie Kondo". The Late Show with Stephen Colbert. CBS. ^ Tonya C. Snyder. The real reasons Marie Kondo’s life-changing magic doesn't work for parents. The Washington Post, 14 January 2016. ^ "As Marie Kondo gets her own Netflix show, can she help me tidy up?". iNews. 31 December 2018. Retrieved 12 January 2019. Look up kondo or tokimeku in Wiktionary, the free dictionary. Wikimedia Commons has media related to Marie Kondo.